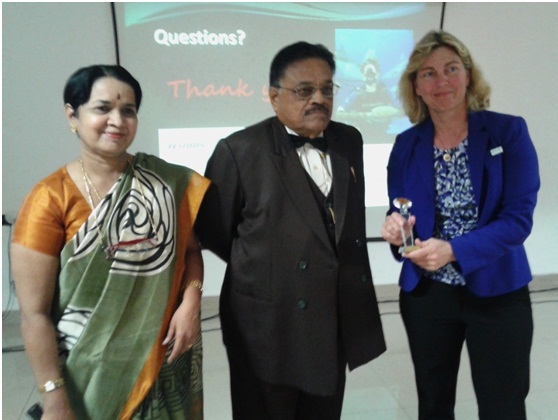 On June 29th, MTS INDIA members Dr. R. Venkatesan, Mr. Nandakumar and Mr. R. Sundar brought along U.S. MTS colleagues Dr. Vembu Subramanian and Donna Kocak (MTS President Elect) to visit VAELS International High School, Chennai, Tamilnadu for educational outreach. 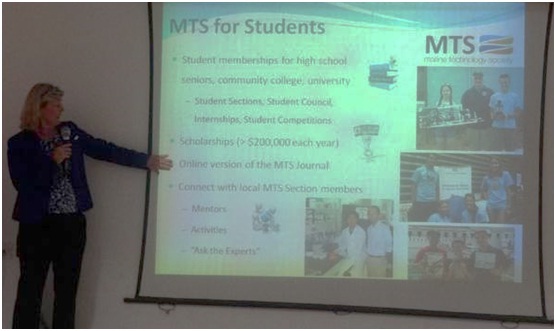 Ms. Kocak presented a talk on "Usage of Robotics in Marine Research, Operations & Advancements" and gave an overview of the Marine Technology Society to a room full of students (grades XI and XII). Students interacted with questions and expressed their interest pursuing careers in marine and underwater technologies. Afterwards, Dr. Subramanian, originally from nearby Chennai, gave the students a "local perspective" inspiring the students to reach for their dreams in any field, be environmental stewards and follow their dreams and believe that they can succeed. Principal Mrs. R. Meenakshi, and Dean Mr. V. Venkatachalam and their staff greeted the MTS visitors with open arms and looked forward to working with the local MTS INDIA Section in some capacity in the future. VAELS is a highly regarded international high school and was recognized recently for its outstanding work done to help young learners become effective global citizens. Go back to the section Page.